Many of you will remember the Bayliss family who lived in Basel until July 2012. 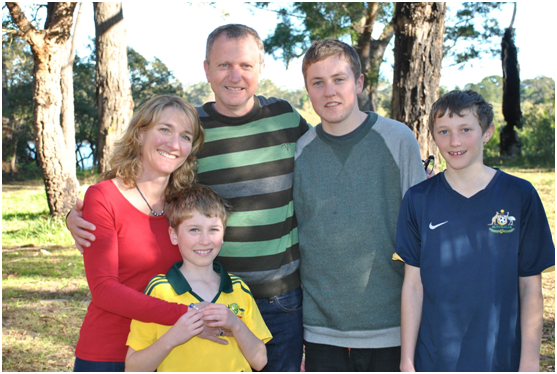 Pete and Lisa and their children Josh, Will and Ollie were active members of the international community here, in the ISB school, Crossroads church and the Basel Dragons Junior Cricket Club. Tragically, aged 47, Lisa has developed the untreatable Cruezfeldt-Jakobs’ disease (CJD), a devastating and rapidly progressing condition that causes deterioration of the brain and dementia. She is currently in a palliative care facility in Sydney. Many of us want to get together in Lisa’s honour so we are organizing a walk on Mother’s Day, Sunday 10th May leaving at 10.00 am from the water fountain on junction of Fleischbachstrasse and Langrüttiweg in Reinach (near to the ISB). We’ll walk for an hour or so and then meet at the firepit just up from there to have a Grill/BBQ together. As Lisa is such a strong supporter of all sports men and women we have decided to wear the Aussie team colours of Green & Gold to show our support for her. You are all warmly invited to wear some yellow and green and join us. We are using this walk as a fundraiser for the family and we will have a collection on the day. It is also possible to give via Chrissie and Pete McMenamin’s ‘mycause’ webpage. Please come and join us to remember our lovely friend Lisa who touched so many peoples’ lives here in Basel and beyond. Members & friends of clubs affiliated to Cricket Switzerland are invited to join the walk on the 10th May, but in the event that you cannot make it, perhaps you would like to make a contribution to the fundraising site mentioned or contact Samantha Russell.